Published: Sun, April 28, 2013 @ 12:01 a.m. In Portage and Stark counties, on a vast stretch of 958 acres straddling Lake and Suffield townships, natural gas company Chesapeake Energy had a plan to drill six horizontal shale wells — all from one pad. It was still early in the Utica Shale play in 2011.The company set out to secure all the mineral rights it could across the plot, but ran into a problem: 23 landowners and homeowners who could not be reached or had no interest in selling the oil and gas reserves thousands of feet below their property. So in November 2011, for the first time in the Utica Shale play, the company turned to a rarely used section of Ohio law governing the development of the state’s mineral resources: It filed a request for unit operations with the Ohio Department of Natural Resources Division of Oil and Gas Resources Management. Eight months later, in July 2012, the division approved the request, forcing those 23 holdouts, accounting for 70 acres, into a single drilling development. Chesapeake’s move is comparable to mandatory pooling, but when it turned to Ohio Revised Code 1509.28, referred to as “unitization,” it used a law that was designed for an entirely different purpose. Since Chesapeake’s application, ODNR has received 11 requests for unit operations, four of which have been approved. Five are pending, and two were resolved outside the agency. The law was adopted in 1965. Until exploration and production companies began to develop the Utica Shale with horizontal drilling, or fracking, ODNR had received only two requests for unitization since its inception, according to the agency. Fracking uses water, chemicals and sand pumped deep into shale rock to extract the oil and natural gas within it. Initially, lawmakers drafted the provision after an oil boom in Morrow County, when multiple vertical wells were being drilled in high density on town lots to help bring up oil from traps, or reservoirs, deep underground. The law set forth spacing rules to counter concerns about over-drilling and the waste that comes with it. It allowed operators seeking permits to efficiently drain those reservoirs and establish boundaries for setting up multiple derricks. Today, though, shale wells require lateral runs that extend thousands of feet. Chesapeake wanted to run six wells at the Rufener Unit, in Stark and Portage counties, between 5,000 and 6,000 feet requiring more acreage to set up a single pad from which it could reduce surface disruption and maximize its return. The law requires that at least 65 percent of landowners in a given unit area agree to drilling, while mandatory pooling requires that 90 percent of landowners agree. Pooling also typically deals with one well, not multiple wells. At the Rufener Unit, Chesapeake had secured 887 acres without unitization, meaning it had far exceeded ODNR’s 65-percent requirement by leasing most properties. Even still, as unitization becomes more common, the process shines a light on obscurities in the state’s mineral-rights laws and how regulators interpret them. Caught in between ODNR — with a mission to develop the state’s resources ­— and the exploration and production companies that spend large sums of money to extract them are the state’s landowners, who often do not understand such complexities and what they stand to lose when selling valuable resources on their property. Attorneys such as Wenger, along with opponents and proponents of unitization, say the practice is becoming more common. Furthermore, it’s likely to increase, especially if annual production numbers in the Utica Shale go up. For those like Vanessa Pesec, president of the Network for Oil and Gas Accountability and Protection (NEOGAP), the practice is unfair and puts nonconforming parties at a disadvantage. “From our perspective, this whole thing of being unitized is a big problem,” she said. “How can you make landowners part of a unit if your bank says no or you want nothing to do with it? Under unitization, ODNR requires that each oil and gas company make a “good faith” effort to lease all landowners in the proposed pool, which is considered the best possible option. At the Rufener Unit, Chesapeake was offering leases at $1,200 per acre, plus a 12.5 percent royalty from the net revenue of each well. For those who choose not to lease their property, or cannot, because of a clause in one’s mortgage or another problem with the land title, the benefits are bleak under unitization. There is no signing bonus and no generous royalty on net revenues. Standard oil and gas leases allow energy companies access to a landowner’s mineral rights in exchange for rents and royalties. When holdouts prevent those companies from developing a desired plot of land, at its core, unitization facilitates uniform development of that acreage as if it were part of a single lease. Hence, while the rights of landowners in a unit are technically protected, some landowners benefit more than others. When land is unitized, property owners without a standard lease can choose to become either a working-interest owner or a non-consenting working-interest owner. Working-interest owners become a partner in the well’s operation. They are responsible for paying, in most instances, up to 200 percent of each well’s cost, which typically take more than $7 million to drill and develop. These costs are subtracted from any potential royalties. Once they’ve satisfied their share of the well’s costs, they receive a one-eighth royalty payment after the wells begin producing. continue to share further costs of operation. Nonconsenting owners do not take on the potential risk of a well not producing after completion, and no surface operations can take place on their property. They, too, are responsible for paying up to 200 percent of each well’s cost, but they also pay up to a 600 percent risk-penalty for failing to take on early costs of development. Once those conditions are met, they receive a one-eighth royalty payment and own a proportionate share of the wells. But for James O’Reilly, a professor of law and public health at the University of Cincinnati, unitization presents a host of problems for landowners. O’Reilly believes the law allows oil and gas companies to compel landowners to consent against their will and then punish them financially, either through reduced royalties or the prospect of property degradation. Though many unit orders include a small provision that states nonconsenting owners cannot be held liable for any property damage, O’Reilly said that administrative clause is both weak and short-lived in a court of law. Further disadvantages, O’Reilly said, come when landowners lose the oil and gas beneath their property by forfeiting the right to lease their land at a later date. He also fears that nearby drilling poses a suit of environmental hazards, even if that drilling occurs miles away. Development, he said, can lead to devaluation of property or future litigation against a landowner, despite the indemnification clauses included with unit agreements. Indeed, production companies would rather not use unitization. The process is time consuming and costly. ODNR eventually could limit the number of annual requests a company can make if the practice grows and each time they’re filed, companies must pay a significant fee to the state. Rhonda Reda, executive director of the Ohio Oil and Gas Energy Education Program, said it is often a last resort. Shale wells typically require vast amounts of acreage, and rarely do landowners 100-acre tracts. Reda said unitization ensures that landowners will be fairly compensated for their mineral rights. Moreover, she said those with small properties might never receive an offer to have their mineral rights developed because a company could not establish a well pad on smaller plots. Mark McGrail, of the United Shaleowners Association in Trumbull County, which works on behalf of landowners, agrees. “If ODNR grants unitization, it’s a good thing, then the company has to negotiate some kind of deal for the property,” he said. In Chesapeake’s case, before and after it was granted unitization, it continued making calls and visits to try and secure more profitable leases for landowners who might have never heard from a production company. What’s more, the application process is a strict one, said officials at ODNR. environmental impacts. It requires far fewer access roads, which reduces traffic in a given area and curbs the need to install numerous tank batteries and production facilities. 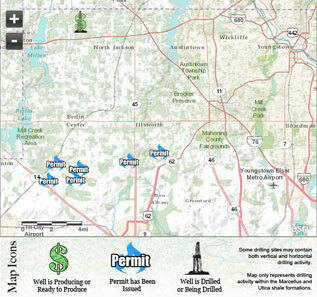 Many of the landowners detailed in documents obtained by The Vindicator were reluctant to discuss their experience with exploration companies or ODNR during the unitization process, most often saying they were not opposed to drilling but felt cornered with few options when confronted by unitization. The documents, which highlighted hearings on the Rufener Unit and several others being pursued by Halcon Resources and BP, for example, show a process that leans toward oil and gas companies. either chose not to speak, did not show up, or did not know that such a hearing was taking place. Chesapeake noted during those proceedings, however, that the parties had been informed. Andrew and Kristi Stalker, who had a small plot of land at the edge of the Rufener Unit, chose to appeal the unitization order with the Ohio Oil and Gas Commission, an independent body of review that hears complaints against ODNR’s Division of Oil and Gas Resources Management. Chesapeake had signed a lease for 11 acres with the Stalkers, who live in Lake Township. When they failed to receive their lease bonus, they learned that Chesapeake had nullified their agreement when the company learned that a clause with their homeowner’s association prohibited them from developing their mineral rights. Chesapeake unitized just two acres of their property. After scrambling to secure a lawyer, the couple was late in submitting an appeal by four days, and the commission rejected it, allowing their property to be unitized. “ODNR says their mission is to enhance gas extraction, but their purpose is tightly linked to the work of the gas industry,” O’Reilly, of the University of Cincinnati said. Still, Ohio is not alone in its pooling laws: 39 other states employ them to ensure the rights of landowners. Operators throughout the country have used such unit plans to successfully develop resources in other productive shale plays. Unitization records also make clear that ODNR has given each request a thorough review, with hard questions for production companies during hearings and delays in the approval process when regulators believe an issue needs more attention. In the end, earlier this month, after estimating that the Rufener Unit held 3.4 billion cubic feet of natural gas and 500,000 barrels of natural gas liquids, at an estimated return of at least $71 million beyond development costs, Chesapeake put 94,205 acres up for sale in Stark and Portage Counties, including the Rufener Unit. A company spokesman said “plans change,” and pointed out that whoever acquires the rights to the unit will have to operate under its agreement — meaning nothing will change for those unitized if a new owner arrives. Without drilling activity, the unit agreement will eventually expire as well. As the practice unfolds, though, it will become increasingly important that ODNR remain diligent, attorneys say. Currently, in Trumbull County, Halcon is attempting to bypass properties that already are leased, by including a provision to “adapt nonconforming leases,” in their request for unit operations, Wenger said. BP recently was approved by ODNR in Mecca and Johnston Townships to recover 300 percent of the well costs, rather than 200 percent. BP’s request was approved by ODNR in only two months.